When the delicate skin of the face, neck, chest, arms and hands starts to sag due to age, it can affect your self image and self esteem. It is a sign of aging that many vibrant, active women and men aren’t ready to see. With the Laser Skin Tightening & Resurfacing Edgewater and Hoboken’s women and men prefer, that sagging skin can be dramatically improved. Attain a look that more closely reflects the ready-for-anything person that you truly are with the amazing effects of Laser Skin Tightening & Resurfacing. How can the latest technology help with loose skin and wrinkles? For many of us, the days of painful cosmetic procedures are over. Today’s technology offers innumerable opportunities to reduce wrinkles and age spots little recovery time and minimal overall discomfort. Now, with laser skin tightening, we also have the luxury of tightening sagging skin, removing acne scars, and eliminating skin spots, pigmentation, and wrinkles in a nonsurgical procedure that produces minimal down time for the patient. Best of all, results tend to be noticeable immediately after the treatment and continue to emerge over the next few months. Two or three treatments, spaced about a month apart, are usually recommended for optimal results. A permanent, long-term result from Laser Skin Tightening & Resurfacing is the regeneration and tightening of the collagen under the skin, which contributes to skin elasticity and vibrancy. 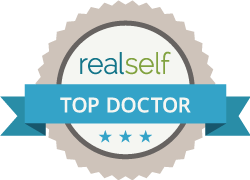 Medical Director and Cosmetic Surgeon Dr. T.G. Khan utilizes the state-of-the-art DEKA SmartXide® DOT Laser, one of the best resurfacing laser technologies on the market. Utilizing 3 different laser settings, Dr. T.G. Khan customizes your treatment according for your exact skin type to maximize your results and give you smooth, healthy, tight skin. The technology gently heats deeper layers of collagen while simultaneously cooling the skin’s outer layers. Because of the way it works, this option is better for many patients than chemical peels and microdermabrasion, while also being far less invasive than major surgery. It works for all skin types and treats wrinkles, loose skin, skin spots and pigmentation, and acne scarring. Best of all, this virtually pain-free procedure produces lasting results with minimal risk, discomfort, and downtime. Why should I get Laser Skin Tightening at the Edgewater and Hoboken Cosmetic Center? At Edgewater and Hoboken Cosmetic & Laser Centers, Dr. T.G. Khan is highly trained in the use of cosmetic lasers for skin tightening as well as other uses including hair removal, vein reduction, tattoo removal, and skin resurfacing. As the Medical Director of the centers, Dr. T.G. Khan is a highly qualified professional in his field. His wide-ranging expertise in surgical as well as non-invasive cosmetic procedures gives his patients the confidence that they are in the hands of a professional with a broad range of knowledge. Dr. T.G. Khan is able to recommend the best and most innovative procedures for the particular complaints and needs of each and every patient. Call Edgewater and Hoboken Cosmetic & Laser Centers today at 201.313.8899 to set up an initial consultation. You’ll be glad you called.